This range of steps glide easily and effortlessly across floors, but once body weight is applied they stay firmly in place. Steel domed feet enclose the spring castors and are fitted with solid, moulded protection rings that grip firmly to the floor when in use. All weather slip resistant, injection moulded treads. Epoxy powder coated in a choice of four colours. 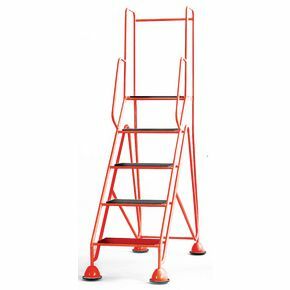 For heavy duty work you will require a sturdy ladder that will let you work with confidence, the extra heavy duty platform steps from Slingsby will enable you to do that. They're high quality steps manufactured from aluminium in the UK, giving the unit strength to support you and your equipment up to a capacity of 170kg. The heavier box section legs add stability and durability to this product, allowing you to get on with your tasks with the knowledge you are well supported from this piece of equipment. There is a strengthening beam incorporated into the non-slip treads, giving excellent under foot grip, providing the users a great sense of security when going up or down the ladder. Our ladders are certified to BS2037 Class 1, so you can be sure that they are suitable for heavy duty industrial work - they are available in a choice of four platform heights; 4.1m, 2.44m, 2.93m and 3.42m with FREE UK Delivery.